Haiku Review: Weleda Sage Deodorant | Bright & Beautyfull! Yesterday was hot — and it’s still hot out, right? * I don’t know, one day of warmth and for some crazy reason, I think that yet another day of warmth will follow! Nutter! Anyway: deodorant. Not the sexiest of beauty products, possibly belonging in the health category, but they exist to help you not smell too bad, and therefore your feelings of beauty are not impinged upon. I went on a kind of purge for a year or so, because I had been addicted to a deodorant that as far as I can tell, in retrospect, basically sealed up all the pores in my pits. There was an impressive absence of pong, but I think it was probably worse for me than smoking 40 cigarettes a day and washing them down with a fifth of Jack. So, I gave up deodorant! It wasn’t as bad as I thought it would be. I used to be very self-conscious about body odor: then I started horseriding and since I was smelling like a whole bunch of other smells, my own stink was the least of it. I did find I was doing laundry much more often, but that seemed to be an okay compromise for my health and wellbeing. Except for all the water! All the water in all the washes! Now that I don’t have my own washing machine in my flat, though, it’s not as easy for me to just bung a load of laundry in, and so I figured I better find myself a deodorant that wasn’t composed entirely of aluminum. 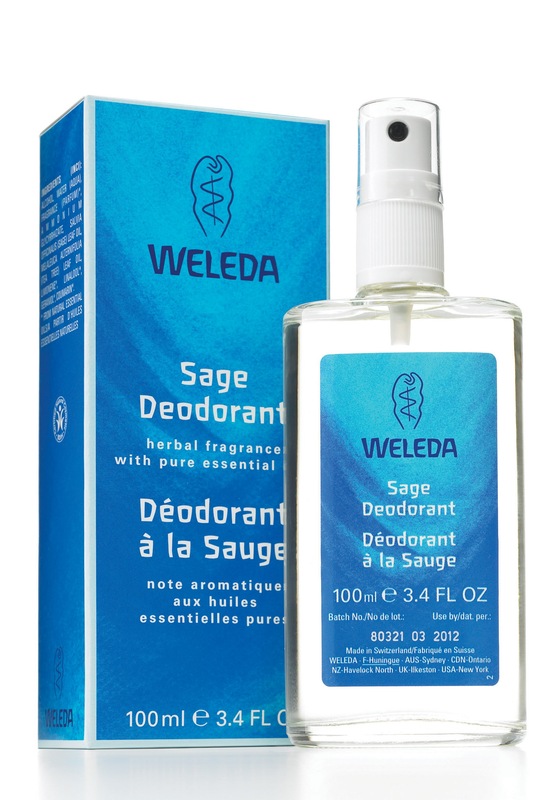 Enter Weleda Sage Deodorant. The Swiss brand are all natural, and I have to say, I have mainly found their packaging — heavy glass containers for most of their lotions and potions — to be unwieldy in the extreme. The deodorant is no different, but I am happy to announce I am over the prejudice against glass because of the refreshing product it contains. It is free of aluminum salts; that’s all I needed to know. It spritzes like a perfume, due to the lack of aerosol, which is a little freaky the first few times you use it, and then fun and refreshing once you become accustomed. The refreshing-ness lasts for about half your day, which may be enough for you. Depends for me, now: if I’m heading out into public later in the day, then that’s fine. It’s not robust enough to use for the horseriding, but in fairness, what is. Trying to deodorize for that is a bit like throwing a deck chair off the Titantic. So: saving water, saving my pits. Noice one! *My phone says it is not very hot out anymore. It is only kind of warm.